It’s still winter here in Botswana but the evenings are getting warmer and the days are starting to be very hot. The maximum temperature over the last two months was 44.2˚C and the minimum was minus 0.4˚C on one extremely cold evening. Nature is following suit and more leaves are falling, which to everyone’s pleasure means that we are able to see further into the bush. These past two months involved a great deal of activity in Kwa Tuli. We were lucky enough to spot a young female leopard (Panthera pardus) two days ago that caught an impala and feasted on it throughout the day. Everyone was very happy to watch her in the morning and later again in the evening. Volunteers saw a rare Cape porcupine (Hystrix africaeuaustralis) yesterday while conducting a crocodile survey. This was followed by a lion sighting. 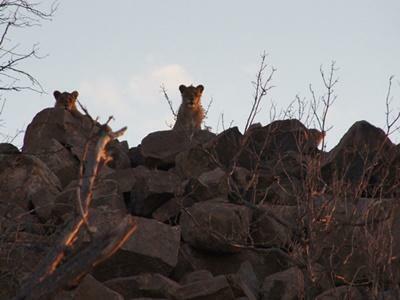 Four lions (Panthera leo) were relaxing on a Kopje (translates from Afrikaans as “little head” and refers to a small hill made from rocks) after a good meal. After all the different tracks that we have been seen around the property over the last couple months, it is a real delight to see this beautiful animal with our own eyes. The volunteers have also seen the brown hyena (Parahyaena brunnea), the spotted hyena (Crocuta crocuta), the African harrier-hawk (Polyboroides typus), the Perl’s fishing owl (Scotopelia peli), the greater painted-snipe (Rostratula benghalensis), the African elephant (Loxodonta africana), the common eland (Tragelaphus oryx) and the giraffe (Giraffa camelopardalis). The high season has come to an end, after 57 volunteers came to help over July and August, which has enabled us to do a lot of important work to improve the reserve. All the activities like anti-poaching, fence patrol and maintenance, erosion control, fence removal, road clearing and repair, elephant identification, and the mammals and birds census have seen continuous development during this period. All the team would, therefore, like to thank all the present and past volunteers for their hard work in making such a huge difference for the environment and the wildlife. We hope you all enjoyed your time with the Kwa Tuli family! We also hope that this latest update will teach you some interesting facts about African wildlife. Our focus on petting wild animals may be particularly pertinent in your home country so you can still continue the great work that you were doing in Botswana by avoiding any place that supports this horrible business! Camera traps are used in conservation on numerous projects to help to identify rare, nocturnal and timid species on the reserve. They are placed in areas where interesting species may be present along with areas that are difficult to access such as paths used by wildlife and those near waterholes. So far, the rare and rather timid species that we have captured on our cameras are: the African civet (Civettictis civetta), the Cape porcupine (Hystrix africaeaustralis), the brown hyena (Parahyaena brunnea), the spotted hyena (Crocuta crocuta), the Cape clawless otter (Aonyx capensis), the honey badger (Mellivora capensis), the large spotted genet, the leopard (Panthera pardus), the bushpig (Potamochoerus larvatus), and the African wild cat (Felis silvestris lybica). To date, 46 species of mammals have been identified on the reserve. 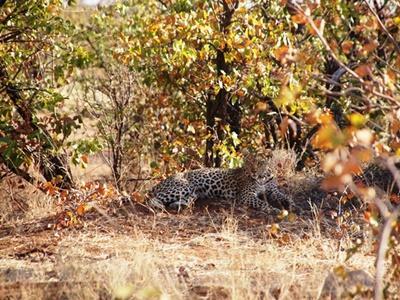 The cameras are also used to track which species are using the reserve’s waterhole and when they are using it. Conflict between humans and wildlife is a big problem in the area and must be taken seriously. There are different kinds of conflict that occur on the reserve. Some farmers who live in the area need to learn how to live in harmony with wildlife and improve their techniques to protect their livestock. Projects Abroad once helped a farmer to fix a kraal (cattle enclosure) where the cows spend the night. The fence was in such bad shape that lions or other predators could easily pass through and kill the cows. By reinforcing the fence, lions were no longer able to cross the fence and subsequently, the cows have not been threatened. Another issue is poaching on the reserve. Villagers come in and set up snares on the main path or near the waterhole in order to catch animals. Their main targets are antelopes like impala (Aepyceros melampus), steenbok (Raphicerus campestris), greater kudu (Tragelaphus strepsiceros), plain zebras (Equus quagga) or even common eland (Tragelaphus oryx). However, snares sadly trap all kinds of animals including predators such as leopards (Panthera pardus), spotted hyenas (Crocuta crocuta) and lions (Panthera leo), as well as antelopes or even elephants (Loxodontha africana). In these cases, the animals can die in a great deal of pain through strangulation, excessive bleeding or dehydration. If they do survive, they still suffer terribly with the pressure of the snare potentially causing the loss of a limb. A few weeks ago, on a neighbouring property, a plain zebra was killed by a lion. The poor animal had lost its hoof when it was trapped in a snare and it was walking on the bone for a long time. Snares are really dangerous for wildlife and it can be years before they are found and destroyed. In the meantime, all kinds of species can fall into its trap. We found and removed more than 22 snares around the property over the last couple of months. It is an important and difficult task, which needs to be done frequently to try to discourage poachers from coming back. We really appreciate the work that the volunteers do in collecting rubbish. From the car, they look for garbage on the road and sometimes even compete to see which team will find the most garbage. The rubbish is thrown on the road by motorists who do not have any consideration for nature or their environment. Volunteers are educated on the trouble that garbage can cause for wildlife and the environment, and they have managed to collect 15 bags of rubbish over the last few months. They found glass and plastic bottles, wire, paper, tins etc. Bottles can be dangerous for wildlife and can kill some smaller species like rodents or insects. The rubbish is not biodegradable and some can take up to one hundred years to decompose. Cigarette butts can take up to a decade to decay while you’re looking at a century for chewing gum and over a thousand years for a plastic bottle! It is, therefore, important to always think about the consequences before throwing any rubbish on the ground. Who has never thought of visiting a centre where you can cuddle baby lions? A place where you can take amazing footage and be close to these incredible creatures. These kinds of parks are wide-spread in South Africa and naive tourists are led to believe that they are helping populations of lions by paying a phenomenal amount of money to see them. However, unfortunately, these centres have no conservation value and in no way help the lion population. Money is sadly the only consideration in this kind of business. The lions are raised like chickens and are exploited to make as much money as possible. The poor lions will never roam free again and they will spend their whole lives in a cage before being hunted by tourists and suffering a great deal. This may sound like a horrible story but sadly, it is the truth. If you really want to help, please avoid all kinds of centres where they allow human contact with animals; whether that be with lions, leopards, tigers, primates or cheetahs. Say no to this cruel business as it has no conservation value whatsoever. If you want to learn more on this subject, please take a look at the flyer on the Projects Abroad website or on our Facebook page. All animals leave behind marks, whether it be in the form of faeces, tracks or scratches. All these are signs of their presence and can be analysed to understand more about them. 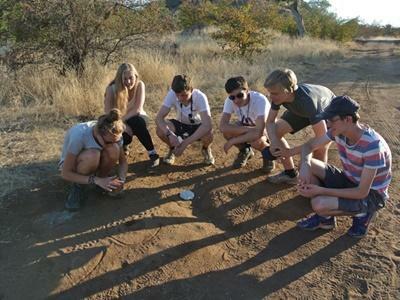 This educational activity is carried out by many volunteers as they learn to read the tracks and recognise species by the clues that they leave behind. Every time we come across a track left by a predator such as a leopard (Pantherapardus), an African civet (Civettictiscivetta), an African wild cat (Felissilvestrislybica) or a lion (Pantheraleo), we identify the track, take the GPS location and note its size. This gives us important information about timid species, nocturnal species, and their localisation in the reserve. 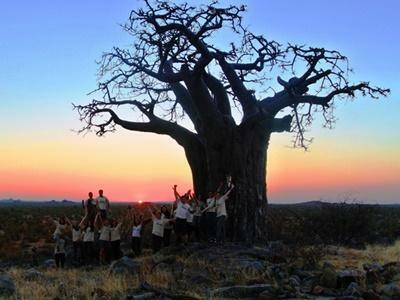 We also teach volunteers how to recognise the different antelopes and wild animals that can be found in the reserve. The giraffe (Giraffacamelopardalis), the common eland (Tragelaphusoryx), the impala (Aepycerosmelampus) and the greater kudu (Tragelaphusstrepsiceros) are often spotted but their track is more difficult to recognise than would be thought. The last time we did spoor tracking, we took some Plaster of Paris to immortalise the tracks. We were very happy to see lion spoor, which has been more common lately. After several attempts, we finally took a brilliant mould of a lion’s track. I am always amazed to see how volunteers learn to recognise tracks. They learn quickly to differentiate between a leopard and a hyena or between a greater kudu and an impala, which is impressive as it is much more difficult than it seems! Erosion control is an important activity in order to maintain fertile soil in the reserve. Over the course of the summer, the much needed rain can also do a great deal of damage by washing fertile soil away. The soil is then lost in the river and can even end up in the ocean. Erosion control is necessary to take care of areas where fertile soil has been lost. Several techniques can be used, depending on the focus of the area and its soil type. Lining up rows of rocks will help to slow down the speed of the water. Dung and seeds will help to fertilize the soil and support the vegetation. Gabions (iron bags filled with rocks) can be used when there is the possibility of significant erosion that could damage property. Natural retaining walls are constructed using woven mopane (Colophospermum mopane) branches and twigs. This natural barrier enables fertile soil and other seeds to be collected rather than washed away with the rain fall. It also assists the germination of a variety of seeds. The use of rocks and fences, which are constructed using elephant dung and mopani branches on top, help to prevent soil erosion. The leaves and seeds found in the dung help keep the soil compact and prevent the water from seeping through. Constructing a wooden fence will also slow down the water and stop the soil from washing away. The last couple of weeks have been spent collecting rocks to strengthen the river bank, which is at risk of erosion next summer. Several rows of rocks and wood have been made to slow down the water from the rain. Dung and seeds have been added in front to improve and accelerate the re-colonization of the vegetation in the area. Volunteers always do an excellent job and enjoy building their own fence.